I have always liked eating baked apples with a little cinnamon and sugar. This morning I thought about using the apples in a simple, delicious and healthy dessert. 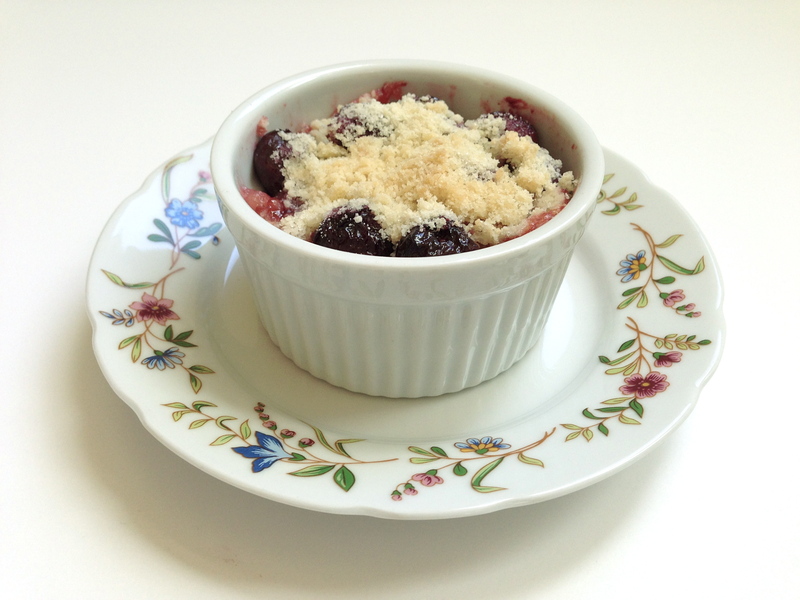 I also wanted to incorporate the frozen dark tart cherries that I had in my freezer. So I thought a cobbler would be the perfect way to use both the apples and the cherries. My husband, who is my biggest critic, loved this! Hope you do too! Mix apples, cinnamon and sugar together in a medium bowl and cook in microwave for 1½ minutes. Using a pastry blender, mix ingredients together in a small bowl so that you have small clumps. Using a vegetable oil and a paper towel, grease the inside of 6 (3½” x 1¾”) ramekins. Place apples along with a little juice on the bottom of each ramekin. Then add the cherries along with a little juice. Finally, sprinkle with crumble topping. Place ramekins on top of a baking sheet. Bake until topping is brown and juices are bubbling around the edges, about 35 minutes. Cool for 15 minutes. Serves 6.